It’s Cathy from My Book a Day. We have a little bit of everything in our family – a teenager, a pre-teen and a preschooler – so we have to do things that everyone will enjoy. Sometimes that’s a bit harder and sometimes we simply adapt. That’s what happened one day in Seattle when we split up and did two separate activities. We visited some of Seattle’s best known spots, and a few that first-timers might not have heard of. Here are my family’s favorite activities from our trip to Seattle, Washington. My husband and daughter wanted to go to the Boeing Factory tour at the Future of Flight Aviation Center. Children under 4 feet tall are not allowed on the tour, so shorter kids (with an adult) can visit the Aerospace Gallery, the gift shop, or the cafe while others are on the factory tour. 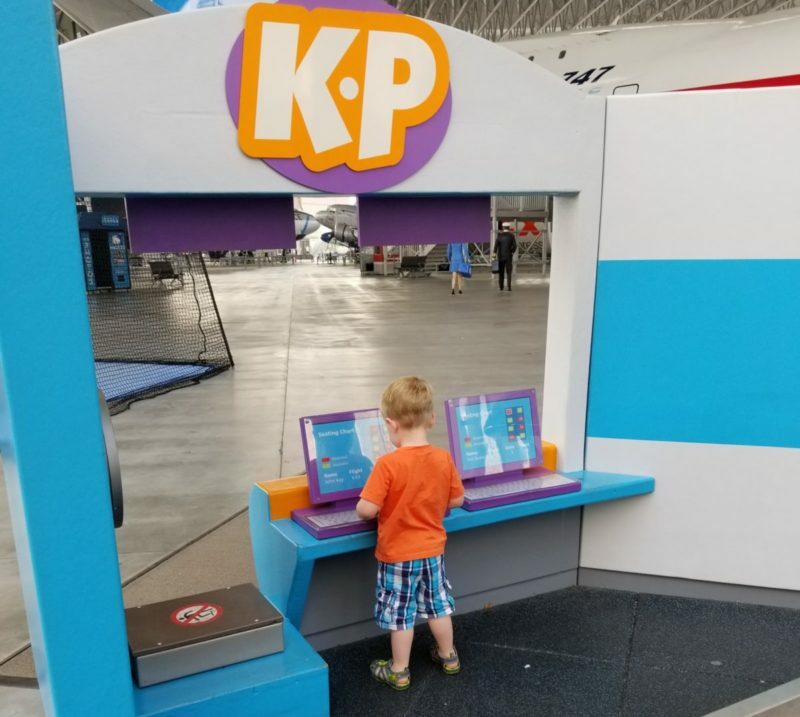 I knew from previous experience that there are fun things for older kids to do, but there are only a few things geared specifically to the the youngest people. The tour lasts about an hour and a half, but our little guy’s attention span didn’t last that long. It was a long time to keep him entertained. While some of our family toured Boeing, the other three of us went to the Imagine Children’s Museum about 15 minutes away. This was the best choice for us. The three of us—our 4 year old, our 12 year old and I—had so much fun! This children’s museum is the best one I personally have visited. There’s something new and fun to do around every corner. We spent tons of time in the water play area, as well as the rooftop playground. There’s also a theater, an Italian restaurant, a farm, a ball tower, an airplane and an art studio. We didn’t make it to the art studio until nearly closing time, but they had a fun craft for the kids to do there. The worker there let us take the art project with us to do a different time. There’s also a fun gift shop to check out on your way out. Sticking with the airplane theme, make sure to check out the Museum of Flight. There are so many things to see and do there. There are even a couple of play areas for kids. Our little guy loved these areas and he asks to go back there regularly. For older visitors, there is a space shuttle fuselage to check out. That’s pretty much a once in a lifetime thing. We loved going through the aircraft that they have on display, including an Air Force One plane and a 787 Dreamliner in the aviation pavilion. The displays on flight were just amazing. This is a must do for everyone who loves flight and airplanes. They have a gift shop as well as a couple of places to grab lunch during your visit. There are tons of other things to do in Seattle as well! One of the things that was on my list was a chocolate tour. It’s not the only chocolate tour in Seattle, but the Theo Chocolates tour was so great! This was another one of those things that we needed to adapt for. They don’t allow kids under 5 on the factory tour, but they do have a story time that’s great for kids. Story time includes chocolate and a kid friendly tour for $8 a person. That was our plan, but our older daughter didn’t feel well that day, so she stayed in the hotel with our little guy while the rest of us went on the tour. I loved it! There were so many samples. It was great to learn about the history of chocolate as well as how cocoa beans are grown. This tour costs $10 a person, and lasts about an hour. Be sure to make reservations in advance as these tours fill up. No visit to Seattle is complete without a trip to Pike Place Market. We enjoyed just wandering the eclectic stores and levels in the market. We checked out the gum wall, how could we not? We watched the fishmongers throw the fish. We ate hot mini donuts at Daily Dozen Donut Company, and had pizza at LoPriore Brothers Pasta Bar. There were so many great restaurants and shops, as well as some really fun urban art. Be sure to find and visit the two pigs, Rachel and her cousin Billie. Speaking of urban art, don’t miss the Fremont Troll. That’s a sight you won’t soon forget. And neither will your kids! Some of our favorite adventures were when we simply picked up some donuts and headed to the lake. We even spent one morning wandering around Alki Beach Park, a beautiful waterfront complete with a mini Statue of Liberty. Seattle really has something for everyone. From sand and water to museums and airplanes, you’ll never be bored! Hi, I'm Cathy! I usually review books at www.mybookaday.com. When I'm not reading or reviewing my latest read, you'll find me chasing my crazy crew wherever the wind blows us. We love to travel as a family, but we have some extra challenges because of the ages of our kids (currently 18, 12, and 4). We've traveled through the United States and even a bit into Canada.